Correct Table Settings: How to Crochet Cloths and Place Mats, Set the Table, Serve the Food. 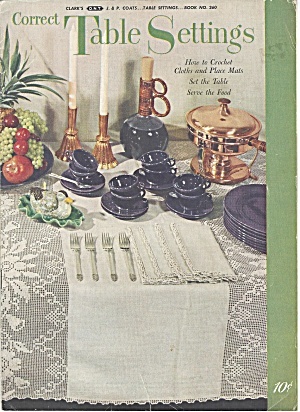 This nice little instruction booklet not only has crochet patters for runners and place mats, but it also schools the reader on various aspects of entertaining, including: the art of table decoration and place setting, Luncheon or Dinner in a one-maid household, The Wedding Table, The Dinner Party, Entertaining without a Maid, The Buffet Part, etc. Lovely patterns and a look into a more "formal" world. In good condition for its age, but does have about 1/2-1 inch cut in the bottom that goes all the way through. It doesn't detract from the use for either reading or following the patterns.